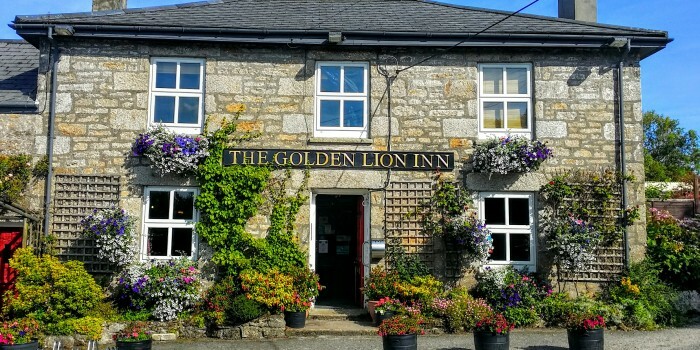 The Golden Lion Inn prides itself in retaining all the charm and atmosphere of its traditional roots as a Cornish country pub, with its oak beamed, granite bar area, boasting three real log fires, slate floors, and high-backed settles. Whether you are looking to enjoy a meal from our extensive menus or simply catch up with friends over a drink, our Bar area is the perfect spot, especially beside the fires after a day on the lake fishing, walking, rowing or windsurfing. Our recently refurbished restaurant is the ideal area for dining. With pleasant views out to our nurtured, flowing gardens and subtle views of the lake, it’s ideal for a romantic quiet table for two, a hungry family for Sunday Lunch or can be converted to accommodate larger groups for birthday parties, family reunions, wedding receptions and Christmas parties. Also, once a month we host a well-attended and thoroughly enjoyable Music Night, with singers and musicians travelling to us from all over the South West. For further details of dates please contact us. Dogs and their owners are also very welcome in our bar area, where we provide the same menu choice and levels of table service as in our Lakeside Restaurant. The Snug is a particularly popular part of our Bar with groups and families looking for a space of their own to enjoy each other’s company. With either three separate tables or as a single large dining table with its own open log fire, The Snug is comfortable for parties of up to thirteen people. Our award winning mature gardens are a wonderful location to enjoy the best that Golden Lion has to offer when the weather smiles upon us, and even when the weather is a little cooler our heated Garden Shelter extends the al fresco experience throughout the year.